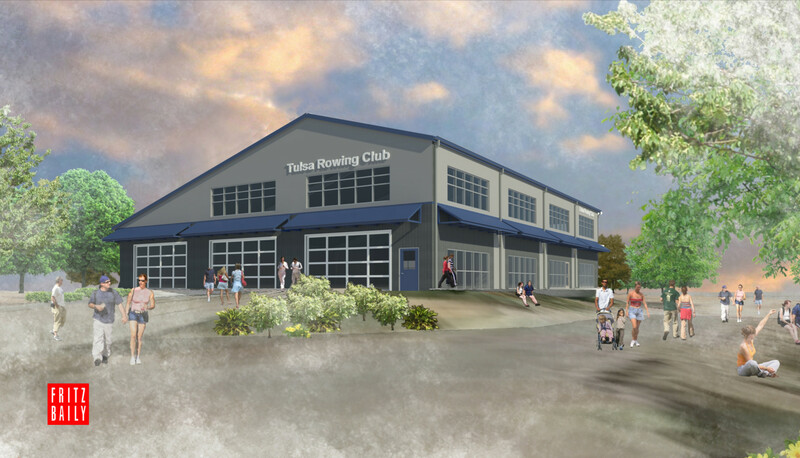 TULSA, Okla. – The Tulsa Rowing Club today released architectural renderings of its new boathouse on the west bank of the Arkansas River that will replace the original 1991 boathouse destroyed by arson fire in 2016. The new boathouse, designed by Fritz Baily Architects, will be situated at the same location as the previous structure, across the river from downtown in Tulsa River Parks Authority’s River West Festival Park area, near 21st Street and Jackson Avenue. The new structure will include three boat bays to store boats. It also will be taller to allow for an upper-story mezzanine-type workout area. According to rowing club leaders, the estimated cost to replace the boathouse is approximately $500,000. The club has adequate insurance to replace a boathouse with the previous warehouse-style design – but not for the increased cost of a design that meets the requirements of the city’s new River Design Overlay (RDO), which was passed after the boathouse was destroyed. Brierre added that if the rowing club were to complete the mezzanine in its updated design, the club would need an additional $120,000, which would allow for a workout space above the boat storage on the east side of the building and provide training facilities for the club’s companion high school rowing program, Tulsa Youth Rowing Association. As a result, the Tulsa Rowing Club has launched a fundraising effort to secure additional money to complete a boathouse that meets the City of Tulsa’s new building requirements for structures along the Arkansas River. The club has already received funds from two Tulsa-area foundations – Cuesta Foundation and ONEOK Foundation. For those interested in assisting with completion of the club’s boathouse on the Arkansas River, donations can be made on the Tulsa Rowing Club website, www.tulsarowing.org, or at the following GoFundMe page: https://www.gofundme.com/tulsa-rowing-club-new-boathouse. Brierre said the rowing club hopes to have final construction plans out for bid in about six weeks, with a groundbreaking for the initial construction set for late spring or early summer 2018. Despite losing the boathouse, rowing club members have still managed to row on a limited basis by renting temporary river-side storage space from the River Parks Authority. The Tulsa Rowing Club, a 501 (c)(3) non-profit organization, serves high school and adult rowers ages 13 to 75 in the Tulsa area. Club members regularly compete in regattas around the country, and the club hosts regattas here in Tulsa. TRC offers free Learn to Row camps in the summer each year for adults who are interested in learning to row. © 2017 Tulsa Rowing Club.